On August 1, 1966, Charles Joseph Whitman killed his wife and mother. Afterward, he ascended the 28 floors of the Main Building at the University of Texas at Austin and took up a position as a sniper. Over the course of approximately one and one-half hours, Whitman shot and killed 14 people and wounded 32 more in and around the campus. Even as the events of the Texas Tower Shootings - as the tragedy in Austin came to be called - were unfolding, the Los Angeles Police Department and the Los Angeles County Sheriff's Office were developing new units within their agencies to deal with violent and volatile situations everyday police officers weren't trained or equipped for. On the heels of the Watts Riots, during which 34 people were killed and more than 1,000 injured, Los Angeles law enforcement officials began to evaluate how similar events could be handled better in the future to minimize civilian and law enforcement casualties and bring about quicker resolutions. It was from these evaluations that the idea of special weapons and tactics evolved. According to the Los Angeles Police Department, the first SWAT unit consisted of 15 4-man teams. The teams were made up of a select group of volunteers, all of whom had prior specialized experience and had served previously in the military. The Los Angeles SWAT unit became a model for departments across the United States and around the world, and police agencies sought ways to meet new challenges facing law enforcement. Once SWAT teams became staples within law enforcement, the traditional response to a high-risk situation was for patrol officers to respond to and secure the area while they awaited the arrival of the better trained and better equipped tactical teams. It was seen as the safest way to minimize casualties, especially police causalities, particularly during hostage situations. The tragic school shooting in Columbine, Colorado on April 24, 1999, caused police to rethink this traditional SWAT response model. In the case of Columbine, it became apparent that during active shooter situations, police could not afford to wait; the importance of eliminating the threat as quickly as possible to minimize deaths and injuries was far too great to wait for SWAT officers to suit up and arrive. While SWAT teams are still reserved for high-risk situations like hostage rescues, warrant service, and riot control, more and more police officers are receiving what once would have been considered basic SWAT training. Also, more patrol officers are carrying semi-automatic rifles and even armor to aid in rapid response to dangerous active shooter situations, and military drawdowns have led to surplus vehicles and weapons being made available to police departments that would otherwise be unable to afford such equipment. The proliferation of such tactics and equipment have led some to voice concerns over what they consider to be a blurring of the lines between military and law enforcement roles and functions. Special Weapons and Tactics teams continue to play a vital role in enforcing laws, particularly in situations that regular patrol officers aren't trained or equipped to handle. The goal of the SWAT team is to respond quickly to dangerous situations and bring them to a swift and hopefully non-violent conclusion. 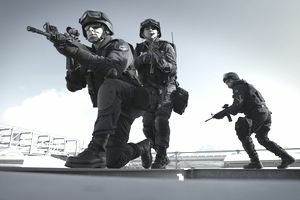 Ultimately, the real job of the SWAT team is to mitigate and minimize casualties to whatever extent possible through special training and tactics. In so doing, their function provides a greater service to the public at large.